Note: This is the bound book only and does not include access to the Enhanced Pearson eText. To order the Enhanced Pearson eText packaged with a bound book, use ISBN 0134057236. 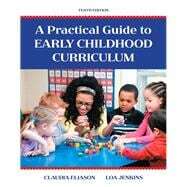 Here is specific, practical help for planning, designing, and implementing effective early childhood curriculum, ages three through eight. In it, readers see clearly how children learn; what children can learn; and the specific concepts, ideas, and strategies that are developmentally appropriate for young children. Reader friendly and filled with examples, anecdotes, and practical, hands-on strategies, activities, and lesson plans, A Practical Guide to Early Childhood Curriculum looks at how to teach, while providing a solid foundation for the theoretical basis of the concepts being applied. Teachers see clearly what can be taught to young children, why it is important, and how it can be accomplished. The emphasis is on the importance of a child-centered curriculum that encompasses the whole child—physical, social, emotional, creative, and cognitive—and the focus is on the developmental needs of the children in the classroom, the cognitive areas of the curriculum, and effective methods of curriculum implementation. The Enhanced Pearson eText features embedded videos and assessments. Claudia Eliason is the co-author of this textbook, now in its 10th edition. She has also authored several peer-reviewed journal articles. She taught 1st grade and then was an Assistant Professor at Utah State University for seven years. After earning her doctorate degree she taught for 16 years at Weber State University in Teacher Education where she was, for five years, the director of the Master of Education program. She retired in 2012 and enjoys time with her husband, six children, and 15 grandchildren. Loa Jenkins taught at Ricks College (now Brigham Young University-Idaho) for 3 years, then Utah State University for 4 years. This fall, 2014, she is retiring from the public school system after teaching early childhood special education for 16 years. She is the co-author of this textbook, Practical Guide to Early Childhood Curriculum, now in its 10th edition. She and her husband have four children and eight grandchildren.